New evidence has come to light that has set Flass free. Commissioner Loeb is behind it, and is supporting Flass for police union president. Jim is pissed and confronts Loeb, who shows him the “new evidence”: a video which features Bullock stating he presented false evidence against Flass. Jim then confronts Bullock, who doesn’t deny it. “We all have our Cobblepot,” Bullock explains. But his didn’t walk back into Gotham. Like Jim, Bullock was given the option of killing a “scumbag mobster” outside a club, or getting shot by his sergeant. Loeb is holding this over Bullock, and Jim wants to go after the commissioner. Bullock tells him that is suicide and won’t help. So Jim enlists the help of Harvey Dent. He tells the D.A. that Loeb has been collecting dirt on cops for years, and is probably collecting on businessmen and politicians. Dent tells Jim that Loeb’s wife died 20 years ago after a fall down the stairs. Rumors circulated that Loeb killed her, but there was never enough proof to convict. Next they go to Loeb’s former partner, Griggs, who offers nothing but an alibi for Loeb and a suggestion that they check in on a Chinese bookie named Xi Lu. So they do, and learn absolutely nothing for their efforts. Lu’s men try to kill Jim and Dent, and Bullock drives by, rescuing them in the nick o’ time. This was all a set-up, so Jim and Bullock take a more direct approach in interrogating Griggs: dangling his head out of a moving car, just inches from the pavement. All he can tell them is that Loeb and Falcone are in on “it” together. Next they have to go bargain with Penguin, who will help them find “the stash” he has heard whispers about. In return, Jim will owe him one favor, and also allow Penguin five minutes alone with the files – but no cop files. Penguin leads Jim and Bullock to a farm house in the middle of nowhere. An older gentleman, Jude, collects them from the road and brings them in for tea with his wife, Marge. Lots of kindly chit-chat leads Jim and Bullock into a false sense of security. Marge goes to get a “key” and returns with a shotgun. A shootout ensues, leaving both Jude and Marge injured. Jim makes Penguin watch them while he and Bullock check out the noises upstairs. In a locked attic room, the cops find Miriam Loeb, a clearly disturbed adult woman who is frozen in childhood. She is Loeb’s daughter. Jim initially thinks that she is locked up here because she witnessed her father killing her mother, but it soon becomes clear that she was the killer. A bang lures them back downstairs, where they find Marge and Jude have escaped. Jim goes back to Loeb with proof that he has found his daughter. Loeb didn’t want her to be sent to Arkham, and offers to resign. But Jim doesn’t want him to resign. He has leverage with Loeb. Instead, Jim wants Flass tried fairly and wants all the files he has on dirty cops sent to Dent. Loeb agrees to the trial, and agrees to give Jim Bullock’s file, but the others remain hidden; otherwise he is a dead man. Miriam will remain where she is, and Loeb will back Jim for the president of the police union. Penguin, naturally, was in on it with Marge and Jude. He has one ticket to Arizona, and pits them against one another to see who gets it. Jude doesn’t want to turn on Marge; Marge has no problem killing him. But it is Penguin who wins: he only has one shell left in his gun, so he had Marge do the dirty work while Penguin takes her out. Meanwhile, Fish has made inroads with Dr. Dulmacher. He gives her a new eye (unearthly blue) and agrees to give her a trial period as his manager. She goes into the basement, demands the prisoners there to free the security agent, then picks a few organ bags to be taken upstairs. Dulmacher is impressed and promotes her to management. His last manager has had his head attached to a Frankenstein-ed female body. He also isn’t worried about Fish escaping: the “hospital/spa/whatever” is located on an otherwise empty island. 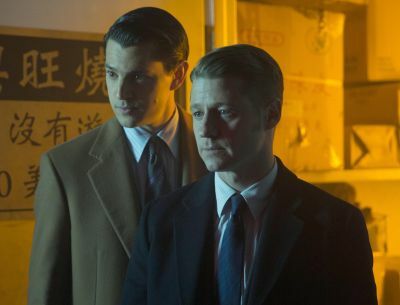 Finally, Alfred going to be just fine (not like anyone doubts that) but Bruce worries over him, especially when Alfred won’t tell Jim who stabbed him. Bruce goes along with this, but is troubled by it. Alfred would prefer to find out for himself why Reggie turned on him. Selena comes by to check up on him. He can barely hide his excitement, and shares with her his concerns: that Wayne Industries is behind this. Tonight’s episode was boring. Too much Jim, too much runaround, too much bureaucracy. There were only two action-ish sequences, and one was with the Chinese bookies, whose entire purpose in this episode seemed to be to pad it to 42 minutes. I feel like it took forever to find out scant information. The scenes with Fish and Dulmacher were the most entertaining, but looking back over it, it was a lot of talk, and very little substance. You can check out the promo for Episode 19 of “Gotham,” set to air April 13, in the player below.